start a business from home | Catrina Latrice Williams. Small businesses are growing all over the world. There are so many ways to start-up a company and become successful. It is vital that potential entrepreneurs ask all of the questions it takes to help them learn how to start-up and maintain a successful business. There are not any wrong questions to ask when it comes to making a life decision such as becoming a business owner. How do I start-up business? Starting up a business require critical thinking skills, creating a plan for success, and taking action. Critical thinking helps when going through the process of brainstorming about business finances, products and customers. Networking with other business associates to help with expansion is usually a part of most business plans, especially if there are financial limitations. Taking action with the right business idea and goals that best matches you will help your start-up business. Get the Entrepreneur Success Manual to guide you step by step on starting a business. What are some ways to fund my business? There are creative ways to funds your business. One way is by using your money. You can start in your home by finding unwanted items that you own and don’t want and sell them. Business investors are another route. There are business investors that will help fund your business under a contract. Most of the times it is to get a percentage of the company profits. A third way is to get a small business loan. Visit SBA.gov for more ways to get funding for your business. It depends on some factors. The type of business you are starting will determine how much money it will take. The company that sells products may have inventory, while service-based enterprises may require technology and software to run their business. It also depends on how you want to start. A one-person owner may decide to only service 5-10 customers per month while a medium size company may hire ten employees within their first 30 days. It is essential to create a business plan so that you know how much your start-up will cost. Small business owners fall in love with the process of working for themselves. It may be challenging in the beginning but the process is worth it. Small business owners have the ability to choose when they work, how often they want to work and who they want to work for. They have more control over their financial conditions. Starting a small business is quite simple when you have the right information. The first step is brainstorming different ideas that you like to do. Next narrow your ideas down to the top 3 business choices. Then, choose a business name that is attractive to the public and simple to spell. Create a product or services that are unique in the marketplace. Find out what customers want and need. Once you brainstorm and choose what type of business you want, next you want to create business goals. There are two categories, short and Long-term goals. Short-term goals are made to be created within a 12-month period. For example, completing a business plan within 30 days or purchasing business supplies within 90 days is short-term. Long-term goals are goals accomplished within one to five years. Business financial goals will increase by 50% in three years or how many employees you want to hire within five years is long-term. Marketing and Promotions are the life of any business. A business that has the best products, a beautiful store and great customer services will go out of business if they do not market their business properly. Marketing and promotions are a way to get your business in front of potential clients. There are different ways to market your business. Some businesses market the traditional way through newspapers, direct-mails, flyers and business cards. In the 21st century, entrepreneurs use online tools to reach their audience. Online business success tools such as state-of-the-art webinars, or follow up services for prospects and more. More businesses are learning how to promote online through social media, Craigslist, Google Adwords and more. Determine what type of marketing and promotions you would like done for your business. Choose a target market first then research the best way to reach your target audience. Starting a small business can be a simple process when you have the right business coach. Catrina Latrice Williams is a successful entrepreneur with a business degree. Her mission is to coach new small business owners to create a successful business. Catrina L. Williams, Book Author of Entrepreneur Success Manual is respected by many for sharing her success tools. In 2007, Catrina started her own business without any mentorship. She asked other professionals for help, but they were more worried about her being competition. With her motivation, Catrina still went for her dreams and goals. In the beginning, Catrina experienced problems such as under charging her clients, lack of business finances, expansion challenges and employee issues. Catrina had never been around anyone who had a business before so she was trying to figure it all out. She didn’t know the requirements it took to grow a successful business. However she decided to enroll in an online university to work towards her Associates Degree in Business. Graduating with a 3.60 G.P.A. and honored on the deans list multiple semesters, Catrina gained more knowledge on succeeding in business. She have serviced more than 75 loyal clients that has used her services a minimum of 3 years. Next, she needed skills on hiring the right employees. She attended different networking events and spent more than 5000 hours learning how to help others succeed in life. In 2011, Catrina has expanded her work at home business. Her business services were offered in Memphis,TN and Charleston, SC. Since then, Catrina has helped many people learn how to become an entrepreneur. Since 2013, Catrina has helped over 400 people learn how to work from home!! Many of them has earn residual income from home while others has built successful business brands for themselves. Catrina realized the lack of knowledge with many during her times of training different employees and helping new entrepreneurs. Many people want to succeed, but most don’t have a mentor or the right knowledge to succeed. Catrina recognized that and wrote her Entrepreneur Success Manual. 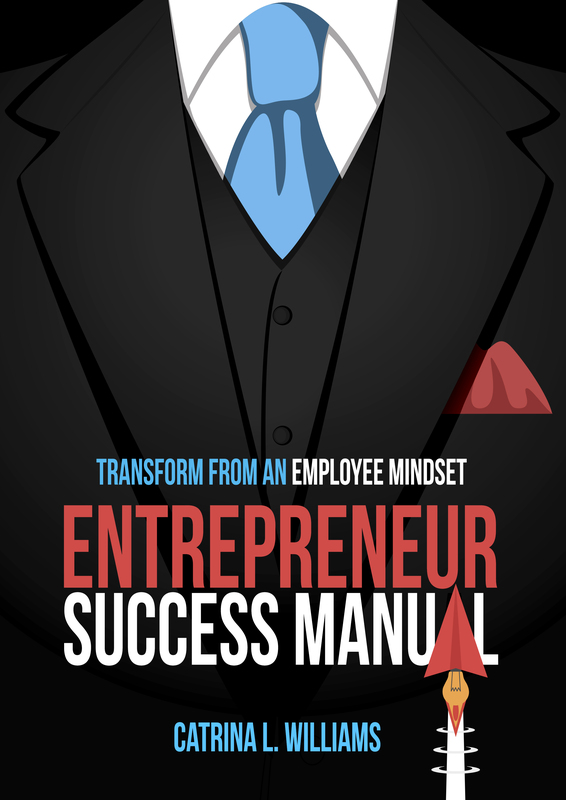 It is a guide to help new entrepreneurs transition from an employee mindset. It also help the skilled leaders check their business plans and daily activities, so they can make changes accordingly. Her e-book is an activity workbook that anyone can start for any business. This is a basic guide to get serious people start their own business. You must know the key requirements needed to work from home. What keeps you striving in life?